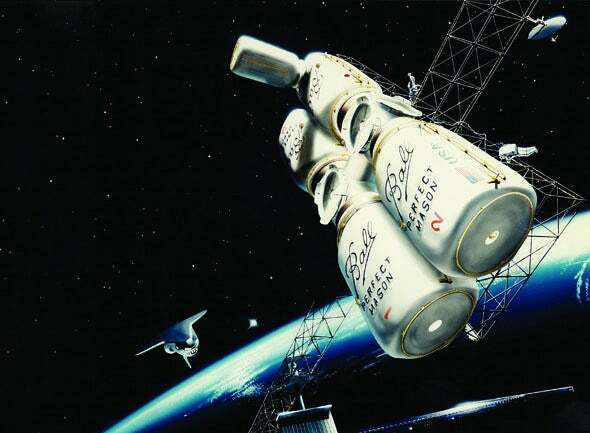 Ball Aerospace: A company known for mason jars helped with NASA's Orion capsule. Even as it was getting out of the glass jar business, Ball put its most recognizable foot forward in this early 1990s ad that ran while Ball was hustling for International Space Station contracts. NASA’s great hope for future manned space exploration, the Orion capsule, was supposed to launch Thursday on its first test flight, but plans were scrapped because of various problems. The team will try again Friday morning. But when the capsule finally lifts off, it will bear the logos of the contractors who built it. Some of the names will be recognizable, like Lockheed Martin. Another logo will ring a bell, but it might seem out of place: the loopy script “Ball” embossed on mason jars the world over. Today the 134-year-old Ball Corp. mostly makes cans: for soup and dog food, beer and soda, and aerosols. But the name is still most strongly associated with the glass jars the company became famous for. That business peaked in 1931, when Ball made 190 million jars (one for every person in the United States that year, with 66 million left over), and in 1993 the home-canning division was spun off into its own company. Ball Aerospace started on a hunch. Ed Ball, son of one of the five founding Ball brothers, needed to find a way to keep his company profitable in the second half of the 20th century. The Ball company began selling tin cans for storing kerosene and went on to dominate the glass mason jar industry. By the end of World War II, with refrigeration replacing home canning, the company was scrambling. Ed proposed starting a research division to help Ball stay competitive. Wanting to compete with larger corporations, but without the budget to build an in-house research department, Ed Ball did what anyone leading an aging tech giant would: He went looking for a start-up to buy. He convinced Ball’s board to invest in a Boulder, Colorado, company that made electronic scales for trucks. The scale business quickly fizzled, but Ball’s outpost led to relationships with a group of physicists at the nearby University of Colorado. The newly formed Ball Brothers Research Corp. started hiring professors and graduate students away from the university, and their rocket-building contracts with them—drawing protest from the university president. Ed Ball was unapologetic. “It was a kind of a faith. It was an instinctive decision that this company would benefit by having a research department that could sell its own work and that could also innovate for this aging, 80 year old glass company,” says Todd Neff, who wrote a book about the company’s 2005 Deep Impact mission. Ball Brothers Research, later renamed Ball Aerospace, was one of the first mouths at the spigot that funds the military-industrial complex. Along the way Ball Aerospace dabbled in Geiger counters and built a machine to make plastic bottles for the Ball Corp., but its roots were in government contracts, and that’s where the company found its success. Ninety-four percent of Ball’s business comes from government sources, with 28 percent of the total for the Pentagon and 20 percent split between NASA and NOAA. Ball Aerospace built instruments for Hubble (and fixed the telescope, too) and it is making the mirrors for Hubble’s replacement, the James Webb Space Telescope, set to launch in 2018. Now Ball finds itself needing to pivot again. “As [government agency] budgets have flattened over the last few years we’ve needed to look beyond some of our traditional markets,” says John Troeltzsch, a Ball program manager. His newest project is Sentinel, a space telescope intended to spot asteroids that could threaten Earth. Sentinel is being developed and funded by a nonprofit, the B612 Foundation, which was formed by a group of former astronauts, scientists, and engineers, including at least one person who formerly worked for Ball. Troeltzsch says it’s the first time that a nonprofit will develop a spacecraft. Ball is turning its eyes overseas as well. It’s building a pollution-monitoring instrument for a Korean satellite, parlaying its experience as a NASA contractor. In the meantime, Ball Aerospace will continue as it has for most of its existence: overshadowed by its parent company and evocative logo, but making something a lot more exciting than mason jars. *Correction, Dec. 4, 2014: This post originally misstated Ball Aerospace & Technologies Corp. as the Ball Aerospace & Technology Corp. It also stated that Ball Aerospace & Technologies Corp. made about $900 billion last year from contracts. It was $900 million.